A Fillies' Novice Stakes over 5f 21y on good to soft going. For most punters, the start and finish of this race will relate to Out Of The Flames. Richard Hannon was a little slow early season but he is warming up nicely with a few bright prospects. This daughter of Showcasing races in the familiar silks of Qatar Racing Ltd. She cost £190,000 at the 2yo breeze-up sales when originally bought by bloodstock agent David Redvers. This chestnut filly was fancied to go well on debut at Ascot. Hitting the lead in the closing stages, connections must have been cheering what looked to be a winning charge only to be beaten in a three-way photo with Mrs Gallagher (who deserved a medal for fighting back the lead after pulling too hard for the whole race) and Ertiyad, who is probably a class filly in the making. Out Of The Flames is a nice-looking horse and fluent, balanced runner. 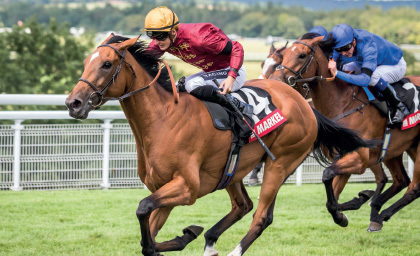 She holds an entry later in the week for the National Stakes Listed race at Sandown so it would seem her owners are confident in taking this first race to victory. It is possible she could make a quick return to Sandown although unlikely. The only slight concern is the going. Is this a one-horse race? It could well be if the favourite runs her race. However, there are a few other juveniles in opposition which deverse some respect. Darkanna is definitely better than seen on debut at Doncaster. Richard Fahey is a trainer who excells with two-year-olds and had many winners this season. This brown filly is an early foal being born in January. She is a good, sturdy type and well bred. A daughter of Dark Angel out of a talented filly called Jadanna. Many readers will rememeber she was trained by James Givens. She won well on debut before taking the Hilary Needler Trophy, then finished 5th in the Queen Mary Stakes Group 2 at Royal Ascot. She was a very talented filly in her own right at two. Darkanna was relatively fancied on debut at Doncaster in what has turned out to be a hot race. She was weak in the betting drifting from 4-1 - 6-1. I wonder if a few people knew she was a keen sort because she pulled exceptionally hard througout that race and had little hope of showing her ability come the finishing line. That proved correct, because she trailed home 9th. There will be much better to come from this juvenile owned by The Cool Silk Partnership. A £205,000 yearling purchase indicates this horse is a decent type but she needs to settle. Fahey has taken his time with her and no doubt been at pains to get her to settle on the gallops. A wide draw isn't ideal. However, I imagine Hanagan will try to get her covered behind horses in an attempt to help her settle. Just seen the betting, and it wouldn't be the biggest surprise to see a few people betting each-way at odds of 12/1. She does have a lot to prove and the favourite looks a tough horse to beat. Karl Burke is represented by Ellthea racing in the familiar silks of Mrs Maureen Gittens. This owner has had a lot of talented horses in her time and a good few have run well at this course. This daughter of Kodiac cost 88,000E and purchased by Mark Gittens. Burke's stable can ready a debutante and they feature decent win and place claims when 10/1 & less SP. With the favourite being so warm in the betting it is best to let the market settle before taking aim. Kodiac Express isn't a hopeless case. She has good pace and a prime draw in stall one. It looks unlikely Mike Murphy's charge will be good enough to win. Geoge Pekham's Rue Cambon cost 150,000E at the yearling sales so a significant purchase. David Evans has been firing in the winners but Listen Alexander needs to find ample improvement on her first start when behind 66-1 winner Capla Dancer. Conclusion: An intriguing race. Out Of The Flames deserves to be a hot favourite and looks a tough horse to beat. She clearly has a reputation with connections considering the National Stakes Listed race. She is expected to win today. Most boxes have been ticked but whether I would jump in at 4/9f? I don't think so. Even if she returns an easy winner, I would be slightly concerned about Darkanna. True, she pulled like a train on debut, and a temperamental horse is never good news. She didn't show a level of form. But she is well bred and cost a lot of money. Fahey would have been working to get her to settle and even if not up to the calibre of the favourite I wouldn't want the potential of any opposition if taking short odds with the favourite. Darkanna is likely to have ability. The question is how much and will she settle? Ellthea is worthy of respect if priced 10/1 & less SP. If the money comes for the favourite and Darkanna is nibbled it will probably take some money to keep here in that best betting guide. I fancy the favourite to win this but if betting I would definitely have a small cover bet on Darkana just in case she shows her mettle today.